Yesterday I spotted a whooping bag (almost 1.3 kg) of red chillies for quick sale at the Chinese supermarket for a mere £3. The chillies were a little off their best, slightly wrinkly but still looking pretty good. I have to take the lot home, too good to leave it. What a bargain! I always buy chilli sauce because fresh red chillies are quite expensive over here around £10/kg normal price, it does not make economical sense to make my own. Having bought this bag of chillies I was excited to make a batch of chilli sauce again. This chilli sauce recipe is really simple, just need a liquidiser to blitz, boil and bottle. The sauce is similar to sriracha sauce. 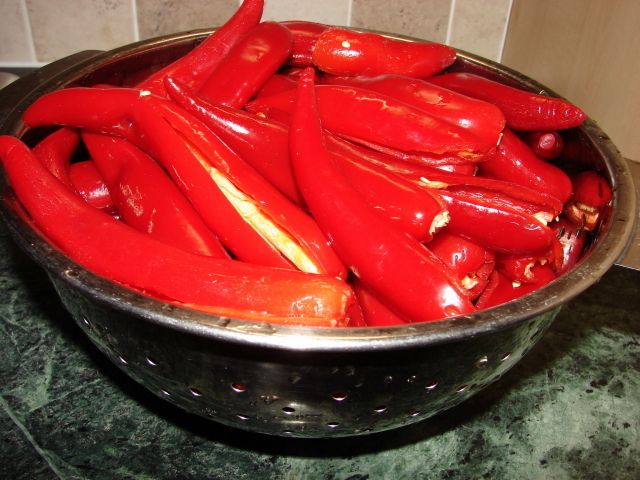 If the chillies are mild you can add some hot chilli powder or boost it with some bird's eye chillies or scotch bonnet. Taste the chillies first before adding super hot chillies or chilli powder. Also bear in mind the ginger will also give a good bite of heat. 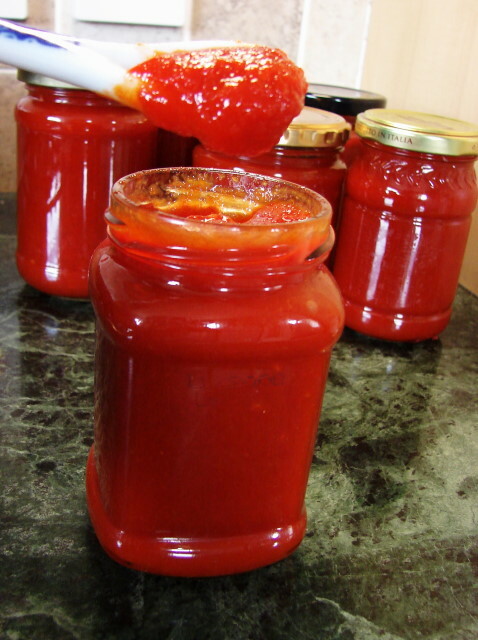 Pectin or gelatin helps the sauce to thicken or set. If you don't like to add this boil the sauce for longer to reduce. Remove chilli stalks, slit open and remove most the seeds but leave the white pith (this white pith is packed with heat) and cut into small chunks. Leave the seeds on is fine if your liquidiser is powerful enough to ground the seeds. . Depending on the size of your liquidiser, blend the chilli and ginger in 2 - 3 batches. Divide the vinegar and add this to the chilli and ginger before blending. Blitz to a smooth puree. Smoother the puree smoother the resulting chilli sauce. Pour into a large pot. Mix sugar, salt and pectin/gelatin together. Add this to the blended chilli. Boil at medium to low heat for about 30 minutes, stirring most of the time. Do watch the mixture. If it starts to boil it will bubble rapidly and spit red sauce all over the cooking area. If you like to take a short break from stirring, cover with a lid ajar. When the mixture has thickened like thick tomato soup it is ready. While the sauce is boiling prepare the bottles or jars. Clean, sterilise and dry the jars/bottles. I boiled used jam jars and lids then dried in a warm oven. 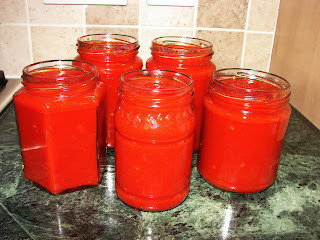 Fill the chilli sauce while it is still hot into hot/warm jars/bottles. A jam jar funnel (also need to sterilise) makes the job easier. Screw on the lids right away. Once cooled a vacuum will form inside the jar making it air tight sealed. This sauce will keep for a long time in a cool and dark cupboard up to a year if jars/bottles are properly sterilised and sealed. Once opened keep in the fridge. Yum - will definitely be trying this the next time I see a load of cheap chillis, or if, fingers crossed I have a bumper crop later in the summer! hi i made this chilli sauce yesterday n it tasted so bitter. i followed the recipe, could you please let me know what happened??? Hi there is nothing tastes bitter on the ingredient list. Did you use all red chillies? If you have used green chillies they could be bitter.